American Jewish leaders meet Congressmen and Senators on first day of new Congress. American Jewish leaders and activists gathered on Capital Hill in Washington DC to mark the opening day of the 115th Congress, on which newly elected and reelected Congressmen and Senators are sworn in. 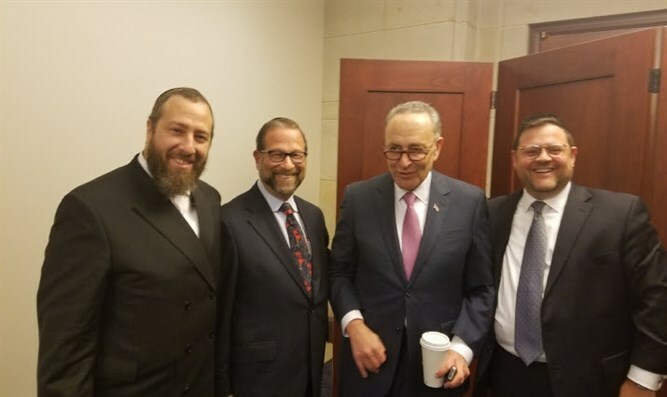 "Today is an important day to be on the Hill," said Chaskel Bennett, a trustee of Agudath Israel of America, "the moment freshmen members realize their dreams of becoming a Congress member and re-elected veterans get sworn back in. It is a day all members remember, hence the importance of being present." Leon Goldenberg, the Chairman of Shalom Torah Academy of NJ, said that the mood on Capital Hill "depends on which side of the aisle you're on. The Republicans are really in a phenomenal mood, but they are talking about working with the other side. Democrats recognize the political landscape and are determined to make their voices heard." Ezra Friedlander, the CEO of The Friedlander Group, said that it is important for Jewish leaders to meet with Congressmen who may not have interacted with Jews before their elections. "We are in Washington today because it is very important that the community introduces itself - the political professionals, the communal leaders, to both Democrats and Republicans. We're very heartened because you feel there is a sense of appreciation for the role of the community. We've been meeting with Senators and Congressional members from across the aisle. We are trying to reinforce a positive message." Friedlander said. He mentioned his meeting with incoming California Senator Kamala Harris (D-CA) as an example of the importance of meeting with new Congressmen. "Kamala Harris, a new senator for California, has not met with many Jewish groups. I felt this was an important opportunity to introduce yourself. That in and of itself is not going to carry the day but it is an important step. A journey of a thousand miles begins with one step. I felt it was important our presence be felt."